How to arrange a Navarathri Golu? So, what exactly is a Golu and how do you arrange one? As mentioned in a previous post, in many parts of South India, one of the key elements of Dussehra or Navarathri festival is the traditional arrangement of dolls in the form of a multi-step display. 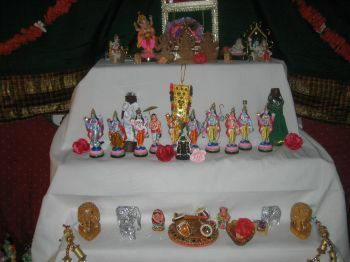 The golu is central to Navarathri, with ladies of the household planning for it months in advance. New dolls are purchased every year and the collection updated with the latest arrivals in the market. Kids are encouraged to participate by making crafts and helping to build miniature gardens, parks or other models. The grandparents and other elders assist by dusting and cleaning the dolls and getting them ready for display. They also provide guidance and directions with regards to how the Golu should be arranged. On Mahalaya Amavasya day, the auspicious new moon day when Mother Goddess Durga is invoked, the golu steps are brought out and set up. Some households have professionally built wooden or steel steps for the purpose. Others use make-shift steps constructed out of cardboard boxes, coffee tables and chairs. What is important is to create a multi-step like platform for the display of dolls. It is customary to construct steps of 3, 5, 7 or 9. The steps are then covered with a clean sheet of cloth, traditionally a white Dhoti. Nowadays, colorful saris and other types of attractive fabric are also used in some Golus that deviate from the conventional. The fabric is pinned up neatly so as to fit to the contour of the steps, creating a bright backdrop for the grand display. The Kalash or the auspicious coconut is placed within a silver or brass pot. It is placed at the centre of the top most step. This is followed by the ‘Marapachi’ dolls – which are a male and female pair of dolls that are characteristic of every Golu. Part of the arrangement involves decorating this couple in fine garments and ornaments made out of shiny paper, sequins or other decorative material. Beginning with Ganesha, all the other idols are placed one after another. There is no hard and fast rule as to which deity goes where, but generally, the top steps are reserved for deities, while the bottom steps are occupied by animal, human and inanimate statues. Popular Golu collections include the Dasavathar set, Lord Krishna’s Ras Leela, Ganesha in different poses, Shiva and Parvathi, a marriage party set, a shopkeeper or grocer set complete with all the grocery items and weights as seen in a traditional Indian grocer’s. Creativity is the main element of a Golu. So, within a broad framework, the golu is basically an expression of originality and creativity – an opportunity for people, especially women, to take a break from monotonous housework and unleash their talents on the occasion of Navarathri. There is really no limit to what can be displayed. Examples of unique and original displays include a miniature model of an Olympic stadium, a cityscape, a cruise ship, a temple on a hilltop, a home-made fountain or volcano, a world famous park or forest, a mall or multistoried shopping center. Many of these are made with recycled material found at home, although there are people who spend time, money and painstaking effort on building professional looking models. Children help with building parks or forests by soaking grams a few days ahead and sprouting them. Other decorative elements such as Christmas lights, flower garlands, Rangoli, beads and handicrafts enhance the golu and differentiate one golu from another. Of course, what breathes life into a golu is all the activities that surround it. Women and children dressed in finery visit each other’s homes to admire the golus, sing songs, exchange sweets and gifts. There is a healthy competition among neighbors, as everyone tries to create the most beautiful Golu in town. Ideas are freely shared and improvised, recipes exchanged, compliments showered. The Golu, at the end of the day, is a reflection of many of the aspects of Indian culture at its glorious best. If you have never seen a Golu, head to a South Indian home today. You are likely to experience something quite extraordinary, and come back with a bag full of goodies!